Indian Muslims shout slogans during a protest against the Chinese government, in Mumbai, India, Sept. 14, 2018. Nearly 150 Indian Muslims demandedg that China stop holding thousands of members of minority Uighur Muslim ethnic group in detention and political indoctrination centers in Xinjiang region. The Western media is guilty of “double standards” when it comes to reporting on China’s restive northwestern region of Xinjiang, the official China Daily said in an editorial Friday. 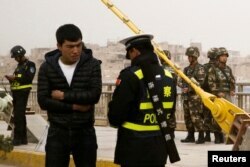 Beijing has denied accusations that it is systematically violating the rights of Xinjiang’s Muslims, saying it is only cracking down on extremism and “splitism” in the region. 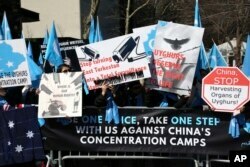 Uighurs and their supporters rally across the street from United Nations headquarters in New York, March 15, 2018. “A double standard is put into service to serve this end: China, critics in the West say, only imagines it faces a terrorist threat, and it is just Western countries that face the real threat of violence born of extremism,” it said.